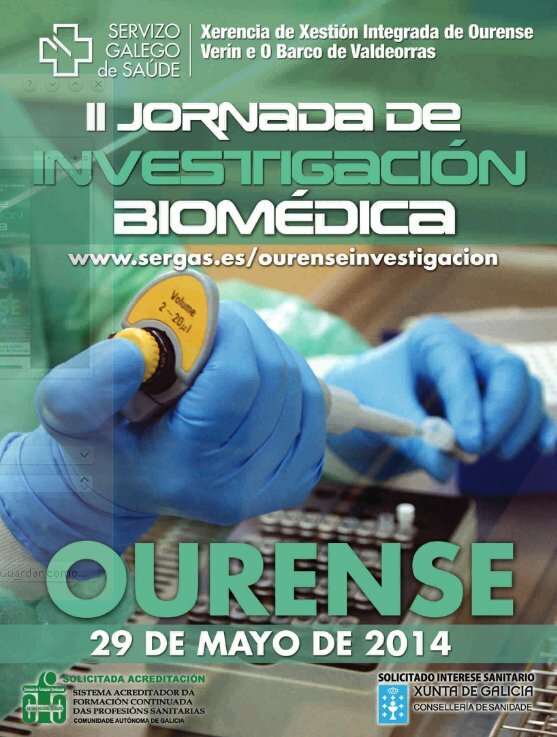 The II Xornada de Investigación Biomédica, where the SING group participates both in the organising committee as well as doing several presentations, took place last 29 may in the Politécnico Building at Ourense Campus (University of Vigo). This second edition was broadcasted by the UVigoTV in this page. You can find more information about the event here and download the schedule of the event here. The II Xornada de Investigación Biomédica, where the SING group participates both in the organising committee and as well as doing several presentations, took place last 29 may in the "Politécnico" Building at Ourense Campus (University of Vigo). This second edition of the event will be broadcasted by the UVigoTV in this page. You can find more information about the event here. You can download the schedule of the event here. “Bioinformatics: The New Breed”, will be the main theme of the XII Symposium on Bioinformatics that will take place on 21-24 September in Sevilla, Spain, at cicCartuja (CSIC-US), with the focus on the participation of younger bioinformaticians. Abstract submission closes on Tuesday, July 1, 2014. The European Society of Clinical Microbiology and Infectious Diseases (ESCMID) has awared our head researcher Anália Lourenço in the Research Grant Awardees 2014. She will receive up to EUR 20'000 each for her project entitled Reconstruction of polymicrobial interactions in infections: the case of Pseudomonas aeruginosa and Candida albicans cross talk in ventilator-associated pneumonia. Daniel Glez-Peña and Hugo López-Fernández have been participating in the Bioinformatics Open Days 2014's, which has been celebrated on 27th and 28th of February in Braga, Portugal. The talk entitled 'Bioinformatics Applications in the SING research Group. 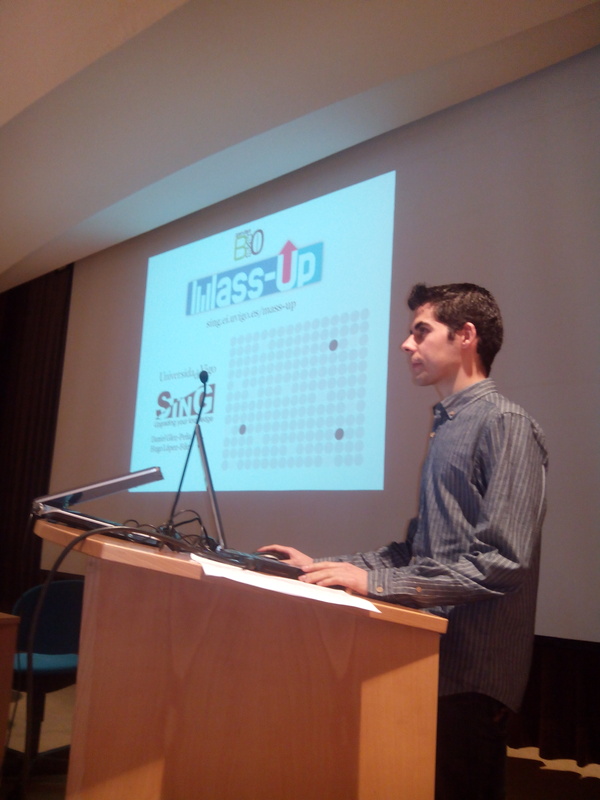 Case study: Mass‑Up, a proteomics workbench', allowed them to present the bioinformatics applications developed by the SING group since 2006 to the present and also to show Mass-Up, our last mass spectrometry tool. Hugo, presenting Mass-Up, one of our last developments. 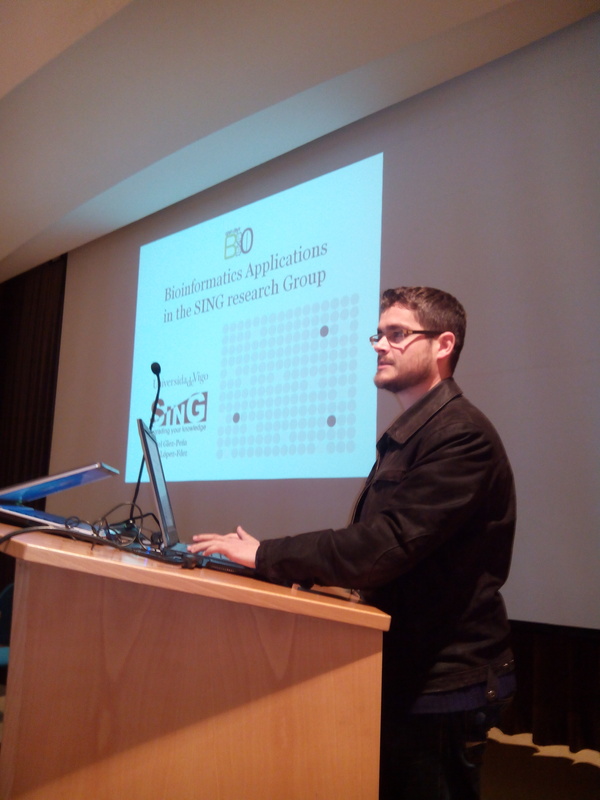 Daniel, talking about the Bioinformatics Applications in the SING Group.